Enzo Life Sciences continues to expand its offering of unique target ELISA products with the introduction of p62 and NBR1 ELISA kits. The p62 (sequestosome 1) and NBR1 ELISA kits provide a quantitative, immunometric detection method for measuring autophagy in human, rat and mouse cell lysates. These sensitive assays measure as little as 66 or 100 pg/ml of NBR1 or p62, respectively, and provide fully quantitative results that surpass semi-quantitative Western blot analysis. With the ability to analyze up to 40 samples in duplicate in less than 3 hours, these kits meet the needs for rapid, high-throughput analysis. Like many other Enzo Life Sciences ELISA kits, the p62 and NBR1 ELISA kits are complete, flexible and thoroughly validated. They are supplied with an easy-to-follow protocol, pre-coated microtiter plate and liquid color-coded reagents to save the user time and reduce errors. The break-a-part strip plate design provides flexibility – not having to run all 96-wells at once. Each kit is put through rigorous fit-for-purpose validation and stability testing to ensure high precision, accuracy, sensitivity, and specificity. Release of the ELISA kits is the most recent addition to the Enzo portfolio of products for autophagy pathway research, including dye-based live cell analysis kits, a focused collection of autophagy inducing and inhibiting compounds, as well as numerous antibodies and proteins. For more information on, or to order the p62 and NBR1 ELISA Kits or other Enzo Life Sciences products, please visit us at www.enzolifesciences.com or call us at 1-800-942-0430. Figure 1: <b>p62 ELISA Measures Induction of Macroautophagy</b>. Human breast cancer cells were treated with either autophagy-inducing drug or vehicle. 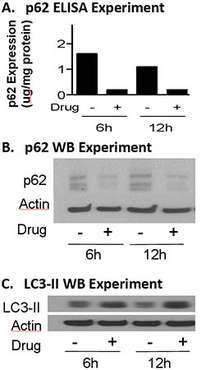 Cells were harvested 6 and 12 hours post-treatment, lysed, and analyzed with the p62 ELISA kit, and for p62 and LC3-II by Western blot. Drug treatment correlated with the induction of autophagy as indicated by the decrease in p62 levels (A and B) and by elevation of LC3-II levels (C).